Index's project Mapping Media Freedom has recorded 59 verified reports in Germany since May 2014. 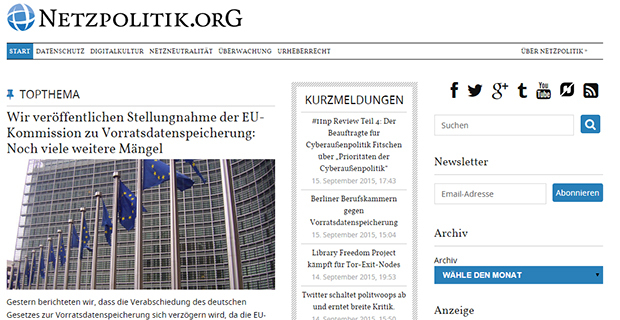 Correspondent Catherine Stupp explores the treason case brought against Netzpolitik. Over a month after the Berlin-based blog Netzpolitik.org was charged with treason for publishing leaked government documents, details are trickling out about the extent German authorities went to in order to build a case against the journalists running the website. The German federal attorney general’s legal case turned out to be flimsy and ultimately collapsed on 10 August. Leading up to the decision to drop the case, public outrage soared over the treason accusation. Journalists associations jumped to the cause and a Berlin protest attracted thousands of supporters. Donations poured in to help the bloggers’ legal battle. But before they gave up, authorities dug deep to try to scrape together evidence against Netzpolitik and its editors Markus Beckedahl and Andre Meister. After weeks of delay the bloggers finally received partial information from their case files. The documents show that German state police obtained a nine-page file on the two Netzpolitik editors’ social security, private residence registrations and bank accounts. Netzpolitik was first informed about the treason investigation on 30 July 2015. The charge was raised after the blog published classified documents from the Verfassungsschutz, Germany’s domestic intelligence agency. NDR reported this week that over a hundred of the agency’s employees had access to those documents. Harald Range, the federal attorney general who launched the case, was forced into early retirement when the legal inquiry became a political scandal in August. Since then, reports have come out suggesting top officials at the federal ministry of justice, the ministry of the interior, and even the chancellor’s office knew about the charges, as well as Verfassungsschutz chief Hans-Georg Maaßen. Government ministers have played dumb about the case in an attempt to shift blame onto the prosecutor’s shoddy execution. “We want the responsible people to take responsibility,” Netzpolitik reporter Anna Biselli told Index on Censorship. “For us it’s quite clear he [Range] would be fired because he was going to retire in half a year anyway,” she said. The case against Netzpolitik marked a historic low for Germany, which ranked number 12 in Reporters without Borders’ 2015 World Press Freedom Index. Hendrik Zörner, spokesperson for the German Journalists’ Association (DJV), said, “From the beginning we saw the risk that journalists would become intimidated by the investigation against Netzpolitik.org.” Zörner also acknowledged that its hard to determine whether there are now chilling effects for journalists in Germany. Biselli told Index on Censorship that the website was propped up by a flow of support. “We have a lot of offers for support even from some of the journalist unions, there are many people donating and others offering to look into legal things for us. So that is really positive,” Bisselli said. The investigation of Netzpolitik is the first time German authorities have pursued a legal case against journalists since 1962, when the well known magazine Der Spiegel was charged with treason for publishing state secrets about the West German military. The magazine shut down temporarily while its founder Rudolf Augstein served 103 days in jail. The case was dismissed by a federal court. “Scarily similar to the Netzpolitik.org case, the information leaked was actually not so new. Large parts of it had already been published before,” wrote Jeanette Hofmann, director of the Berlin-based Institut für Internet und Gesellschaft, in an op-ed last month for the website Internet Policy Review. “A betrayal of state secrets requires by definition that there is a secret,” Hofmann wrote. Considering the classified information at the heart of both the Spiegel and Netzpolitik investigations had already been reported, Hofmann argued, calling the documents “state secrets” was always a stretch. Catherine Stupp is a journalist based in Berlin and an EU regional correspondent for Mapping Media Freedom.